I am excited by the opportunity of being the new Principal at Clifton Springs Primary School. Prior to my most recent leadership position as Acting Principal at Ceres PS, I have been a Campus Principal at Lorne-Aireys Inlet P-12 College. I have also held school leadership roles over the last 25 years. These positions of responsibility have always reflected my passion for education. I do have another passion, environmental education, and have voluntarily worked In Indonesia, Maldives and Eritrea for AusAid and UNICEF providing community and schools with education on how to maximize their natural resources and maintain a healthy quality of life. I’ve maintained a teaching role in my position as Acting Principal and Campus Principal, which has included teaching PE, Art or Music. In my personal time I enjoy time with my family and friends. I love to keep fit and make the most of the Surf Coast environment where I live. Look forward to meeting you all if I haven't already! Our motto is Innovate, Engage, Excel and our aim is to engage our community through valuing: Respect, Responsibility, Empathy, Innovation and Excellence. Clifton Springs Primary School is a vibrant, innovative and genuinely student centered school situated in the heart of the growing Clifton Springs / Curlewis growth area. We create a safe and friendly learning environment where students develop confidence, creativity and leadership skills. We promote a growth mindset in students where they are set challenging achievable learning and personal goals and are supported by staff and families to achieve them. Our high quality teaching and learning program provides students with the skills to become active community members and lifelong learners. As an inclusive school and community we promote acceptance and celebration of difference. Our high quality evidence based approach focuses on what students are ready to learn and our staff work in collaborative teams with a focus on shared accountability through the use of Professional Learning Teams. We are a community of learners who have shaped our program based on current best practice in pedagogy supported by research. As a staff we actively engage in action research in line with our strategic plan to better meet the needs of our students academically and socially. We believe that students have the greatest chance of reaching their potential if a cooperative approach is taken by students, staff and families. This cooperative approach is what makes our school an active and vibrant "learning community". We want our families to be partners in learning and we promote this through Student Led Conferences, open days, family events, assemblies, formal and informal meetings, student support groups, Autism Networks and regular learning opportunities being provided for families in classroom support, child development and networking. We have continued to forge ahead as a leading school in Student Voice and leadership development evidenced by our very active student leadership groups and structures including our Student Representative Council, School Captains, House Captains, Sports Academy, ICT leaders, Environmental leaders and POD Squad to name just a few. These student leaders drive a number of projects across the school and have brought significant change to our programs and approaches. To develop outstanding citizens and life long learners who believe that effort and persistence leads to success. Through our core values of Respect, Responsibility, Empathy, Innovation and Excellence we strive to make a difference in our community and environment. 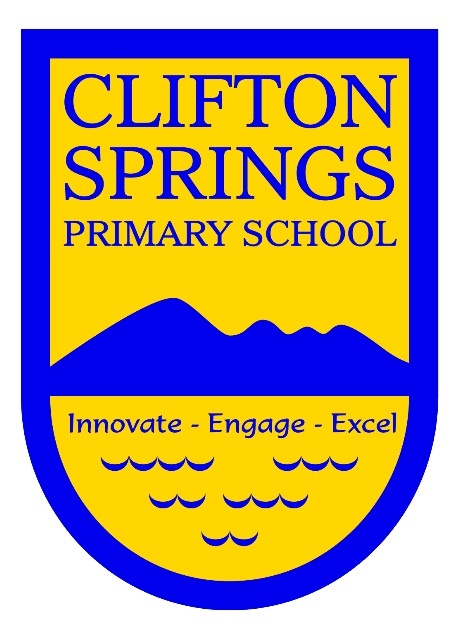 Clifton Springs Primary School is a medium sized school with an enrolment of approximately 434 students enrolled for 2019. The school is ideally located in the thriving community of Clifton Springs on the Bellarine Peninsula approximately 20 km from Geelong. Clifton Springs Primary School takes in seaside and rural aspects, flanked by Griggs Creek and taking in a view across the bay to the You Yangs which forms the school's logo. The school’s first class facilities include well-appointed classrooms, expansive grounds and specialist facilities including a library, art room, science room, music room (with recording studio) and gymnasium. It is important that our parents and the community have access to some of our key documents which drive the work we are doing as a school community or reflect on the work we have done. In this section of the About Us page I have included some of those key documents for you. 2016 Annual Report to the school Community. Each year Department of Education Schools complete an Annual Report to the school community about their progress and achievement from the previous year. Please find our 2016 Annual Report opposite. Please find attached our 2017 Annual Implementation Plan (AIP) which outlines the our strategic direction for the 2017 year and includes the allocation of equity funding.